Family means everything. Especially when it comes to chives, a delicious member of the onion family. Smaller, tender, and more of a fresh garlic taste make chives a little bit easier to work with in the kitchen than green onions or scallions. With their mild and sweet flavor, they are often preferable to the palate because, they won’t overwhelm other flavors in a dish. Chives are a colorful and aromatic addition to any savory recipe. Chives are really best eaten raw— add them as a topping to salads, soups, potatoes, omelette and a cheese tray. The pink flowers of chives are edible too. We don’t usually include these in our fresh cut packages. However our organic living plants will bloom in the spring if you keep it growing over the winter. Sold at the peak of freshness. 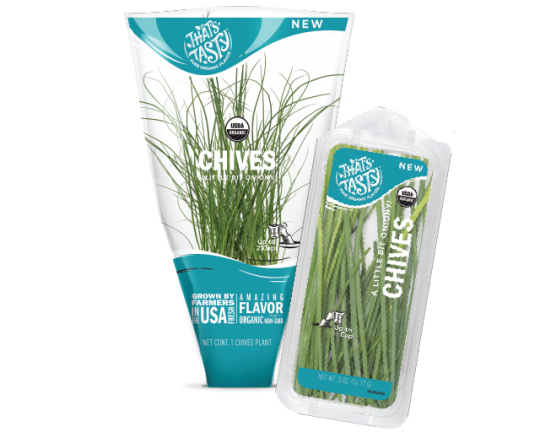 Our chives are grown and sold to be used right away for the best flavor. This go-with-anything herb will have you fulfilling all your ultimate cooking a-chive-ments! Triple the amount you would use for dry herbs and add just before serving. Chives are happiest inside their package, hanging out in your refrigerator drawer. Have extra chives? No problem. Try these fresh ideas for how to use it quickly. Whip up this easy chive butter. Add a stick of softened butter and chopped chives into a glass bowl. Mix them thoroughly. Add a pinch of Kosher salt to taste. Add to greek yogurt and keep in a mason jar in the fridge, for a go-to sandwich spread.